Fleas are external parasites which can be found attached to the skin of their hosts. 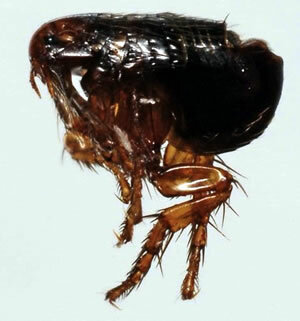 Adult fleas are about 1/8 inch long. Their bodies are shiny and reddish-brown in color. They are covered with microscopic hair and are compressed to allow for easy movement through animal fur. Fleas do not have wings, although they are capable of jumping long distances. They have three sets of elongated legs. Pest Solutions 365 can determine the size of the flea infestation and your pest control needs with a professional pest audit. Only $25 for a 20-minute inspection. Flea infestations require multi-faceted treatment plans. Addressing a pet’s infestation or individual flea bites will not prove effective for ridding your home of fleas. Effective flea control should encompass both chemical and natural methods and should be conducted on your pet as well as inside and outside of your home. The primary plan of action should be to examine your pet daily. Catching fleas early will hamper their effect on your pets and in your house. Treatment will be most successful if your home is cleaned before our Pest Solutions 365 experts arrive. We’ll ask you vacuum thoroughly, sweep and mop hard-surfaced floors, wash all bedding and linens and clear the floor of debris. After taking these steps, we will administer proper treatment to infested locations within and outside of your home.